"May those who come behind us find us faithful." You may recognize this lyric. It is just one line in a popular song from the 90's called "Find us Faithful." The full lyrics can be found here. So here's the thing - as we write about our ancestors who passed down their faith to us, I draw a blank. Not that Christ wasn't introduced to me - first by the Catholic Church, then by my older sister who led me to the Lord after she became a Christian in high school. No, my blank goes further back. For I did not grow up with older spiritual mentors and models. I became a Christian through reading my sisters journals. Yep. She'd write to Jesus every night, and hide her black & white composition book in the most stupidest of places. I'd fish it out when she wasn't home, and howl with laughter over her love letters to Jesus. Only . . . little did I know that her words to Him were piercing my heart with a love I never knew existed. I became a journal writer myself. And before the electronic world of blogging, I filled notebooks with my prayers and musings on faith. And since I have not had a faith passed down to me by the wisdom of my ancestors, these journals are what I will pass down to those who follow me. The majority of the conversations I had with the Lord are penned in those books that are now in a box in the attic, as well as on my blog which I will "back-up" and perhaps even get bound in to books themselves so that they can be physically passed down. What started through reading one's journal, continued on to writing my own conversations in my spiritual journals. If I were to be asked, "Joline, how did you know what to write?" I would simply answer, "I sat quietly most of the time, which is hard for me, and just . . . let the pen go. No agenda. No purpose. While there are sermon notes, and book studies interspersed throughout the journals, the majority of the writings are prayer requests and conversations with Lord - or what I heard Him telling me. One can't go into an appointment like that with any outline or agenda other than to drink in what He has in store. 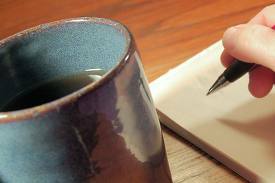 Many surprises were discovered through my days of journal writing." My journals will be an open book to those who come after me. My children. Their children. No hiding my journey. In fact, I'm thinking that my writing days, as in, using pen and paper, may need to make a comeback.